AMCARE Senior Life Partners, Inc. Helping Hands Companion Care, Inc. 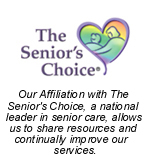 Preferred In Home Care Inc.
Stellar Senior Home Care, Inc. Living At Home Senior Care, Inc.
Partners Assisted Living Services, Inc.
Home Loving Senior Care, Inc. If you or a loved one needs senior home care in Cape Cod, Boston, or the surrounding area, contact North River Home Care today!